We are examining the effects of long-term changes in vegetation and rainfall seasonality on soil carbon and nitrogen cycling and the partitioning of gas and solution losses. The study utilizes an ongoing ecohydrological field site located on the Idaho National Laboratory (INL) in southeastern Idaho on the upper Snake River Plain. This work is in collaboration with Dr. Matt Germino at the USGS. The experiment was constructed in 1993 and consists of 3 replicated blocks of 4 soil cap configurations, 2 planted vegetation types, and 3 irrigation treatments to create a strip-split-plot design (for more details and illustrations see Anderson and Forman 2002). Main plots (8 m X 8 m) are divided into six subplots representing the 2 vegetation types and 3 irrigation treatments with ambient plots receiving no supplemental irrigation, the growing season irrigation treatment consists of 4 applications of 50 mm of water at biweekly intervals beginning in mid-June, and a dormant irrigation treatment has 200 mm of water applied as quickly as possible in October or early April each year, when plots are snow-free and plants are dormant. In a 5 year program, we are developing capacity to do socio-ecological science in Idaho and examining historical, contemporary and future scenarios of regional growth. The American West is perceived as a vast, open landscape, yet this frontier has been undergoing unprecedented rates of urban and regional growth. Indeed, the four States with the fastest population growth rates between 2000 and 2010 were Nevada (35.1%), Arizona (24.6%), Utah (23.8%), and Idaho (21.1%) (Census, 2010). Idaho is unique among these states because it currently has no large cities with a population over 1 million. However, current growth projections indicate that the population of Idaho will nearly double from 1.5 to 2.5 million people by 2050 (Census 2010). Understanding the spatial configuration of urban land use relative to other types of land uses, particularly as a set of rate-dependent, spatial interactions will be critical for determining future trajectories in this region. Understanding how feedbacks between human perceptions, values, and beliefs affect, if not drive, these transitions will also be integral to this research. Ephemeral streams make up a large proportion of surface waters in the Western United States (89%), particularly in Arizona (94%) and desert southwest, yet little is known about their structure and function and how they will respond to changes in climate. To fill this gap, we are evaluating the structure and function of ephemeral washes in Arizona with a recently funded DOD SERDP grant. We established sites in natural ephemeral washes at 13 locations distributed across a climate gradient in Arizona and are currently establishing baseline data on the hydrology, biogeochemistry, and riparian and invertebrate ecology. This grant will be complementary to the urban runoff grant described below in that we will establish background rates of C and N cycling in natural washes. Rapid and widespread urbanization in semi-arid regions is altering hydrology and nitrogen (N) biogeochemistry through modification of hydrosystems and inputs of materials (carbon, nitrogen, soils). These modifications have important environmental consequences for storm runoff of nitrate and pollutants and emissions of environmentally important trace gases, yet little is known regarding how urban modifications alter critical ecosystem services provided by stream ecosystems. Recent findings by Gallo et al. (2012, 2013a,b) show that much like humid catchments, increasing catchment impervious surfaces does significantly increase discharge and runoff ratios (15, 16) and the delivery of nitrate to stream channels (17-19). 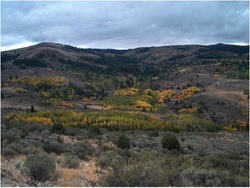 In contrast, increasing impervious cover also significantly increases the frequency and duration of ephemeral stream flow, thus concentrating limited water resources in space (ephemeral urban streams) and possibly extending periods of time for biogeochemical cycling due to these hydrologic subsidies (and likely increased carbon (C) and nitrogen (N)) (Gallo et al. 2013). Indeed, studies indicate that ephemeral stream channels and urban drainage networks exert greater influence on runoff quality than other physical characteristics (e.g., land use type, road density) leading to the hypothesis that much of the biogeochemical processing and gaseous N losses is occurring within the substrate of ephemeral channels between runoff events, with important consequences for delivery of N to areas of focused groundwater recharge. Indeed, our current research is showing that human modifications result in tradeoffs between nitrogen (N) trace gas emissions and aqueous losses in ephemeral streams in Arizona, one of the fastest growing states in the USA (Lohse et al., in preparation). Losses as nitrous oxide, a potent greenhouse gas, are extremely high from ephemeral channels following small rainfall events (mean 459 mg nitrous oxide-N/ m^2/hr, maximum 3122 mg nitrous oxide-N/m^2/hr) (Gallo et al. 2014, published on-line) and even higher following flood pulse events (Gallo et al., in preparation).